ADOPTABLE CATS! Visit our Adopt A Pet or Petfinder pages for photos/info. 1. Meet the animal(s) you're interested in to see if your home & family are a good fit. If the animal is in a foster home, we can arrange a meeting. 2. Fill out an application. Printable applications available HERE, and at the shelter. Please note: We understand how disappointing it can be if an application is denied or if there's a wait time before adoption. Sometimes apps can be approved right away, and sometimes it may take longer if staff need to contact your vet or landlord, or if the animal is still receiving medical care. Please be patient, as we are working to help ensure a successful adoption and keep the pet from being brought back to us for avoidable reasons. If for some reason your application is not approved, often it simply means that more than 1 application was received for the same animal, or that the animal you're interested in would not be a good fit for your home or family. For example, a dog with a history of nipping would likely not be approved to a home with small children. Please talk to our staff about any animals you're interested in so they might help make a great match. 3. Pay an adoption fee (see below) once the application has been approved. 4. 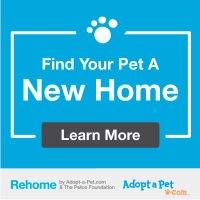 Take your new family member home! Fees include some vaccines (including rabies for dogs/cats over 4 months), deworming medication, flea treatment, microchipping for animals over 12 weeks, and a spay/neuter voucher. Prices are subject to change without notice. If the pet has already been spayed/neutered when he/she arrives at the shelter, the adoption fee is only around $35. Please add $2 processing fee for debit/credit cards. *Note: Different vets charge different rates for spay/neuter, so the spay/neuter voucher may not cover 100% of the charges. Please inquire with your vet. Am I looking for a low energy pet to be a couch potato, or a more active pet? Will I have the time & patience to exercise, socialize, and train a pet? Will my pet need to get along well with other pets and/or children? Can I afford the food, supplies, and veterinary care (routine and emergent) for my pet? Aren't puppies adorable? Click HERE for advice on puppy adoption from veterinarian and animal behaviorist Dr. Ian Dunbar. Seriously, don't adopt before you read this. Our favorite line...."It only takes a few weeks to ruin an otherwise perfect puppy." Just so you know, we think our puppies are perfect when they leave our shelter, and we don't want them back due to poor parenting.